"Wigs And Shades" will be one of the featured works at the Arts Club of Washington's "Duality Show," in the Monroe Gallery, April 5-27. Very busy with show, competition and gallery applications. All 7 works entered in Burwell-Morgan Art At The Mill show were accepted! See "Exhibitions" page for dates. "InSecurity" accepted in "Signs Of The Times" national juried show, Gallery Clarendon, Arlington VA. See Exhibitions page for details. Two paintings accepted in "Small Works, Big Impact" national juried show, Gallery Art Underground, Arlington VA. See Exhibitions page for details. Showing on 9th floor at Artomatic 2017, Room #9616! See Exhibitions page for details. Painting accepted in MFA@Gallery B show, Bethesda MD. See Exhibitions page for details. Award (to be announced shortly) from American Art Awards. Stay tuned! "The Road to Syracuse" will be showing at Gallery Underground's National Road Trip exhibition from May 2 - 28. Reception: May 6 from 5 - 8 p.m. The show at the Waddell Gallery is down. Second Place award in MFA@Gallery B show! See entry below and Exhibitions page. Three paintings accepted by noted Zenith gallerist Margery Goldberg for MFA@Gallery B show, Bethesda MD. See Exhibitions page for details. Accepted into "Scale" show at Live An Artful Life Gallery, The Plains, VA. See Exhibitions page for details. Upcoming show, "Glimpses," with realist artist Dennis Crayon at 1st Stage Theatre Gallery, Tysons Corner. See Exhibitions page for details. Now a member of the Maryland Federation of Art. 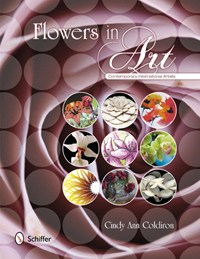 5 paintings included in "Flowers in Art: Contemporary International Artists," Cindy Ann Coldiron, author; book available through Schiffer Publishing.